♫ WIRELESS KARAOKE MICROPHONES - A Handheld Wireless Microphones with a portable mini home KTV for Music Playing and Singing at anytime. Easy to connect to phone(iphone and android both work),just download the singing app then you can sing along,when the LED light flicker with music ,you will feel like a super star. ♫ COLORFUL LED LIGHTING - There are three side colorful of 48 LED lights, with the rhythm of the strength of the flashing music, creating a true Karaoke atmosphere. You don't need to go to karaoke room if you want to sing,just stay at home and sing.When the night falls,turn on the LED mic and sing,it is fantastic that the LED light flicker with music. ♫ ADVANCED TECHNOLOGY - Aluminum-magnesium alloy shell,Professional tuning system,Three-layer high-density noise reduction,Intelligent mixing chip,Intelligent compatible design,Professional audio processor,High-quality dual speakers. It is easy to use and has all important buttons (treble,bass,volume,music and echo)for singing needs.There is a button at the top of the switch for the next, previous, play&pause and as well as the switch for the lights. ♫ REMARKABLY KTV ECHO EFFECT - The highest quality chipset with two channel stereo headphones,more stunning KTV live-sound,more clear music rhythm with echo reverberation. And it has many great other features like Treble,Bass,Accompany.You can manage the volume, put the SD card and rechargeable. 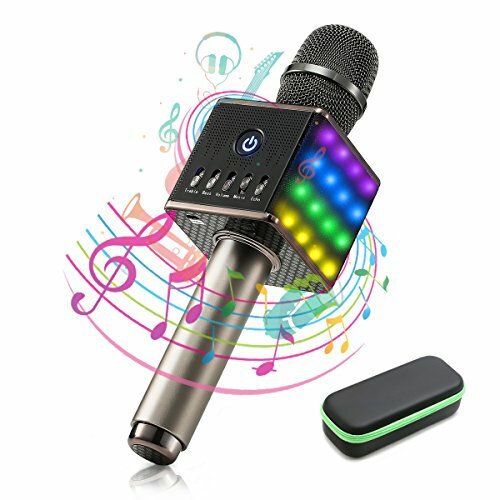 ♫ PACKAGE - NASUM 1*LED Wireless Karaoke Microphone,1*USB Cable,1*User Manual1*Micro USB to Audio Cable,1*Carry Case(100% Protection).It is a great gift for your family and friends.